In the third & final instalment of my recent Newcastle Haul I show you a few goodies that I picked up in Primark which include one thing I needed and a few that, well, I just wanted! I think Primark is a bit like marmite, you either absolutely love it or completely loathe the place. Personally I love it, but not on weekends, on weekends I would rather go fight with an angry bear than face the masses in a Primark store, it’s just not worth it. But it was Tuesday, it was fairly quiet for Primark and I decided to brave it and see what I could find on the rails and shelves. As you may already have gathered I really like the basic flat shoes that you can get from Primark but the white ones that I got earlier this year had almost disintegrated at this point and so I was on the hunt for another pair. These tan ones go perfectly with my Fiorelli Tote that I got for my birthday in January and at £6 I really won’t be bothered if these only last until the end of the summer. Next up are the two items that I didn’t need but that I really wanted. First up, my Minion vest! I’ve no idea if this is a PJ top or what but I love it and it looks awesome with jeans or shorts for a few drinks at the pub or a quiet BBQ, plus again it was only £6 so by wearing it once already I’ve probably had my monies worth out of it! 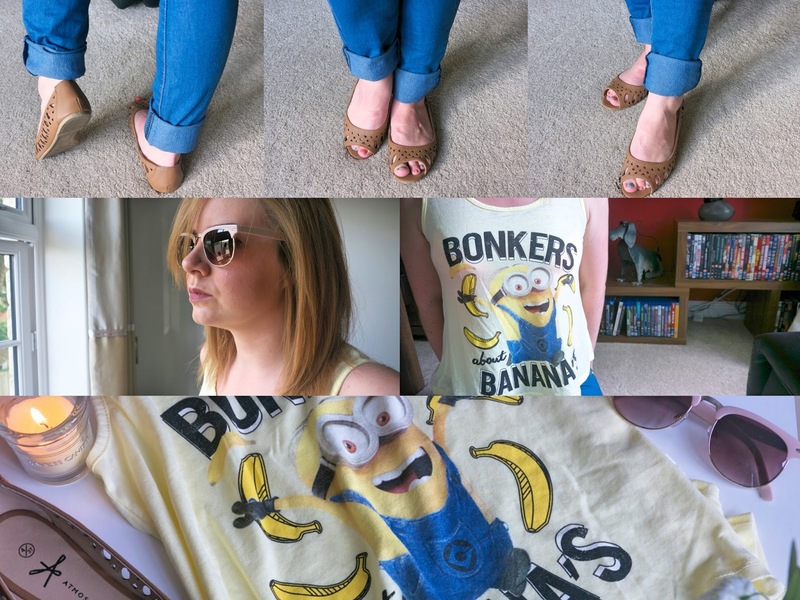 I am a big fan of the Despicable Me films so this Bob vest was always going to be a hit with me! Lastly, these RayBan-esque sunglasses were just £2! I love the mixed style and the fact that they manage to look very feminine thanks to the pale pink frames, despite being on the chunky side. As I’ve said personally I don’t mind a bit of Primark and I think you can get some great value staple pieces from there and I’m sure you will have seen some of these on my Instagram feed lately!